With its five-star facilities and professional staff, La Grande Métairie has everything you need to enjoy a camping holiday with a classy touch. 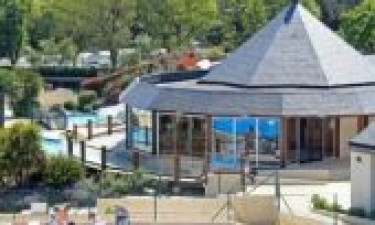 Book your accommodation at this unique holiday camping site with the camping experts at LuxCamp. La Grande Métairie has made the most of the rich natural and cultural resources of the surrounding area to offer a truly luxurious camping experience. Explore this unique environment by spending a day at Carnac beach, cruising along the Morbihan Gulf, visiting the nearby 18-hole golf course, relaxing at a thalassotherapy centre, or exploring botanical gardens and traditional artisan workshops. This luxury campsite offers up to 8 different types of accommodation in pitches ranging from 80 to over 130 square metres. Standard mobile home villas feature 3 bedrooms, 2 bathrooms, satellite TV, and a private furnished garden, whereas other mobile homes come with added comforts, like a dishwasher and king-sized beds. Guests of all ages can have fun at the site's landscaped pool complex, which features indoor and outdoor pools, fun water slides, a jacuzzi, whirlpool baths, and easy access to the campsite's bar. Water polo and diving lessons are also available. Adults can keep busy at the fitness area, go fishing or boating while kids and teenagers have fun at the skate park, try bicross, go ziplining, or visit the mini zoo, where they can interact with alpacas, goats, ducks, an even go on a pony ride once a week. Other activities include arts and crafts sessions, treasure hunts, group performances, and a weekend circus school. La Grande Métairie has a bright and spacious restaurant with indoor and outdoor seating areas that offer panoramic views. The menu features a variety of snacks and a-la-carte Breton specialties. Take-away meals are also available from the campsite's snack bar. Two bars keep provide evening entertainment with live music, karaoke contests, and themed evenings. 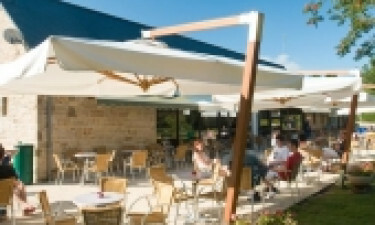 Quality foodstuffs can be found at the campsite's supermarket, which sells baked goods, wines, fresh fruit and vegetables, international newspapers, souvenirs, maps, and the most sought-after Breton products. La Grande Métairie has its own clothing store, and more shops can be found in the nearest town, which is just 2.5 kilometres away.